Vaccination is administered at tail-docking time at a week or two of age by scratching the skin inside of a rear leg and placing a drop of vaccine on the surface. The epidermis contains large numbers of antigen-presenting cells, so this is a minimally-invasive but particularly effective way of inducing immunization. Our traditional autogenous vaccine is made by crushing a scab from the lesion of a lamb infected with contagious ecthyma in 10 mL of water and adding two drops (0.1 mL) of a 0.94% solution of formaldehyde so that the final concentration of formaldehyde is 3.1 mM. The formaldehyde is added to kill bacteria in the scab. Although it also may denature the viral proteins, which could interfere with recognition of soremouth poxvirus, this approach has been effective in our flock. At weaning time, many of our lambs develop an eye infection (pink eye) which can be treated with antibiotics but the infection is finally resolved only when the animals develop immunity. Thus, in an attempt to induce early immunity to pink-eye using our autogenous vaccine, a second immunogen is added to our autogenous vaccine. After adding the crushed scab from a contagious ecthyma infection, the end of a Q-tip is used to swab the eye of an infected lamb and then the Q-tip swab is added to the water before adding the formaldehyde, followed by capping and shaking the tube to mix the antigens and formaldehyde. Vaccination Schedules to Raise Antibody Concentrations Against epsilon-Toxin of Clostridium perfringens in Ewes and their Triplet Lambs Cristina de la Rosa, Douglas E. Hogue, and Michael L. Thonney Journal of Animal Science (1997) 75:2328-233 ABSTRACT: The objective of this experiment was to compare vaccination schedules for ewes and their lambs to raise antibody concentrations to e-toxin of Clostridium perfringens, the causative agent of enterotoxemia. Half of 200 Finnsheep ´ Dorset ewes were vaccinated with C. perfringens type D toxoid vaccine 3 wk before lambing. Serum samples were obtained from 20 ewes that were to be vaccinated and 20 ewes that would remain unvaccinated before treatment and at wk 2, 1, and 0 before the start of lambing. Antibody concentrations in sera of unvaccinated ewes remained at 2 IU/mL, but they peaked in vaccinated ewes at 15 IU/mL by wk 1 before lambing. Lambs from each of the first 13 and the first 14 sets of triplets from vaccinated and unvaccinated ewes, respectively, received one of three vaccination treatments: no vaccine (control), vaccination on d 1 and 21 of age, or vaccination on d 21 and 42 of age. Antibody concentrations declined in sera of vaccinated ewes from 8.5 IU/mL immediately after lambing to 3 IU/mL 12 wk later. Vaccination of lambs did not increase sera antibody concentration. 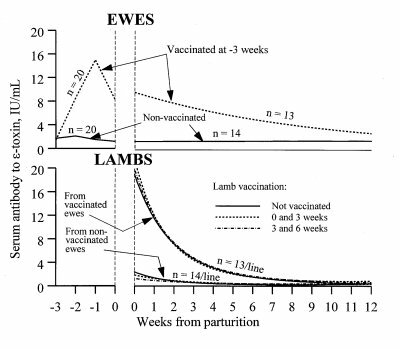 However, prepartum vaccination of ewes significantly increased lamb antibody concentrations (19 IU/mL) compared with lambs reared by unvaccinated ewes (2 IU/mL). Vaccination of ewes resulted in lambs with higher antibody concentrations until wk 10 postpartum. Concentrations declined to .6 IU/mL in all lambs at 12 wk. Because concentrations of .2 IU/mL may be protective, these results indicate that vaccination of ewes before lambing imparts passive protection in lambs to 12 wk of age, whereas vaccination of young lambs provides no added protection. Figure 1. Effect of vaccination schedule of ewes and their triplet lambs on serum antibodies to e-toxin of Clostridium perfringens type D.
Eradication of Footrot This procedure was written by Brian Magee and Mike Thonney. We are not veterinarians so we can only report what Brian used to eradicate footrot from the Cornell flock in 1997. Despite what is written in the Sheep Production Handbook (SPH), Brian’s experience is that formaldehyde treatment is the only method that works to eradicate the disease. Formalin is a solution of 37% formaldehyde*. Brian was able to eradicate foot rot from the Cornell flock over a period of about 3 months; this is quite a short time period compared to the use of other methods, which can go on for years. Foot bath method The Sheep Production Handbook indicates that the dilution should be 1 part formalin to 19 parts water, but this was found to be too dilute to be effective. The dilution that worked was 1 part formalin to 9 parts water (1:10 or 10% solution of formalin which is the same as 3.7% solution of formaldehyde). The 10% solution of formalin was too strong to allow the sheep to stand in for very long. The structure and use of the foot bath is important. Brian made a footbath from finished 1″ lumber. He used a 1″x 8″ x 8′ foot board for the bottom and 1″ x 2″ lumber for the sides screwed tightly together. He soaked the structure with water for a day or so to swell it together. He then emptied the water and placed about 1″ of wool in the bottom to minimize splash. He filled the foot bath with a 10% formalin solution. He ran the sheep through a chute into the foot bath (maybe about 5 seconds per sheep so that all four feet got soaked). Spray method For ewes that needed additional treatment, Brian used a 1 in 7 dilution of formalin (5.3% formaldehyde) in a plastic squeeze bottle (bottle with a handle to squeeze to spray out solution). He tipped each sheep up and sprayed each foot, especially between the toes, after appropriate trimming. This only needed to be done once for most sheep; all sheep were treated on the same day and turned into clean pasture. This may be the simplest and most effective method and might work well in place of the initial foot bath for small flocks. Obtaining formalin ACROS formaldehyde can be ordered from Fisher Scientific. Order the 1 liter (L) quantity. You will have to create an account and log in to order it. Be sure to use a company name. It might take a day or two to get approved by customer service. *Use all indicated precautions (gloves, ventilation, goggles) when working with formalin. All animals older than 18 months of age must be eartagged with official eartags. All animals under 18 months of age must be eartagged with official eartags unless they are going directly to slaughter. Eartag records must be maintained for 5 years.